A fine, two-storey 19th-century house and two courtyards are at the heart of an 89ac farm at Johnstown, Slanemore, Co Westmeath. 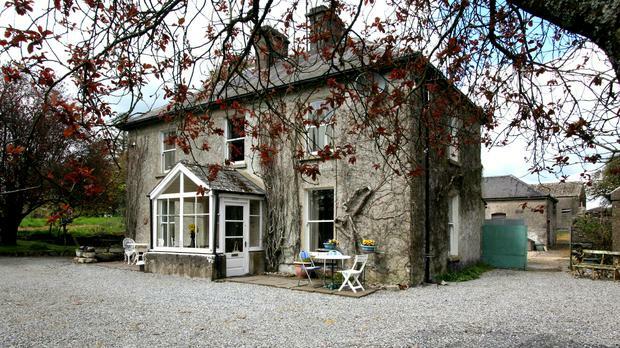 The property is coming to auction with a guide price of €700,000. Located 8km northwest of Mullingar the holding is made up of 70ac of good elevated ground in great heart which tapers off to a 19ac piece of lower ground that could do with some attention. With plenty of road frontage the house and lands are reached by a tree-lined avenue. The ground is laid out in three large fields covered with a generous sward of grass. The makings of a central roadway leads down through the middle of the property which, in recent years, was rented by farmers from the northwest for summer grazing. The ground has been well managed and in fine condition. The house is a fine two-storey traditional farmhouse with accommodation that includes an entrance porch, an entrance hall with the original red and black tiled floor. The drawing room is centred around an open fireplace while many of the original features such as cornicing and timber flooring are still in place. The dining room also has a timber floor and a fireplace while the kitchen is of the traditional type with a range and a flagstone floor served by a utility room with a tiled floor. Upstairs there are three bedrooms, one with a built-in wardrobe and two with cast iron fireplaces. There are two bathrooms, the family bathroom, with WC, wash hand basin and shower and a shower room. Other features include sash windows, a private well and a private waste water treatment system. The house is set in lovely grounds and there is a courtyard with a range of dated stables and storage buildings suitable for a variety of uses. The place is attracting a lot of interest. "It will have a range of customers from farmers to part-time farmers to hobby farmers. This is commuting country so farmers and non-farmers are in the market for land in this general area," Dillon Murtagh explains. The property will be sold by public auction at the Greville Arms Hotel, Mullingar at 3pm on Thursday, June 14.